The UW Polish Studies Endowment Committee invites to a screening of the animated movie A Trip To Nowhere. This 30 min film, written, directed and illustrated by Shannon Hart-Reed, tells the story of WWII Soviet deportation of Polish men, women and children to gulag camps where so many perished. Based on the stories of the survivors from the Seattle area, historical introduction by Martha Golubiec. Organized by UW PSEC. Update: There is also an Iranian documentary shot in the 1970s about the Siberian exiles who passed during WWII through then Persia. More about it here. 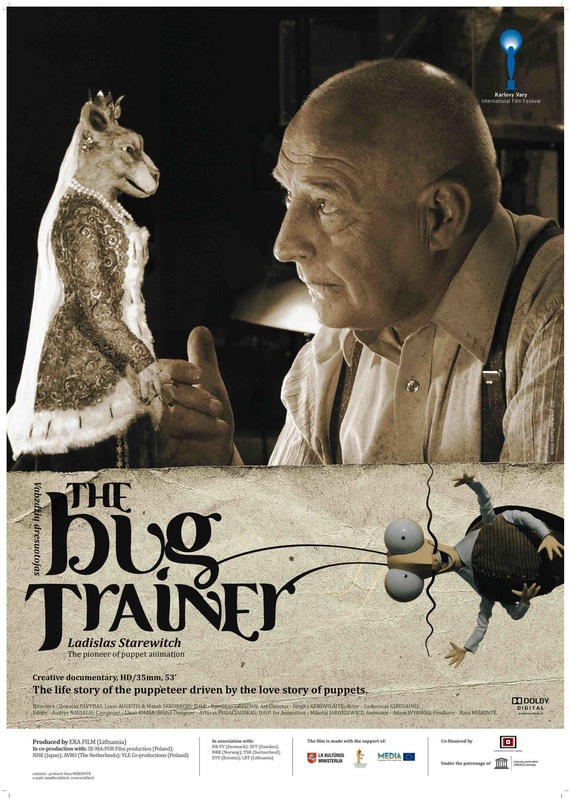 Northwest Film Forum in Seattle presents The Bug Trainer, a creative documentary about animation film genius, Ladislav Starevich (born Wladyslaw Starewicz). The movie, produced by R. Miskynite & directed by D. Ulvydas, L. Augutis & M. Skrobecki explores Starevich's ideas and concepts and explains why he is considered one of the greatest creators of the animation world. The book for the meeting is Chwalcie laki umajone by Michal Olszewski published by Wyd. Czarne in 2005. This literal and metaphorical journey through Poland is full of author's personal reminiscences. Olszewski is a journalist and a writer. The book is available on the Internet or from Club members. Club meetings are in Polish. The Jackson School of International Studies invites to Poland and the Baltic Republics in the New Century - a meeting with Dr. Steven Stoltenberg of the US State Department. Dr. Stoltenberg is a foreign affairs analyst for Poland and the Baltic countries. He studied at the Jagiellonian U. in Cracow, Poland in 1984 and was eyewitness to to the 1989 peaceful transformation in Poland. The Chopin Foundation Northwest Chapter invites to an all Chopin concert by Ning An. Mr. An is the winner of the 2000 Chopin competition in the United States and a young star who has performed to a very good reviews at the Carnegie Hall and in Europe. The program includes Barcarolle, mazurkas op.30, nocturnes op.9, three waltzes, two scherzos and rondo E flat Maj. In celebration of Chopin's 200th birthday Dr. Julia Lee, Professor of Piano will perform Chopin's 2nd Piano Concerto with the University of Portland Community Orchestra, conducted by Dr. Kenneth Kleszynski. Where: at Buckley Center Auditorium on the University of Portland campus, 5000 N Willamette Blvd., Portland, OR. Admission free. 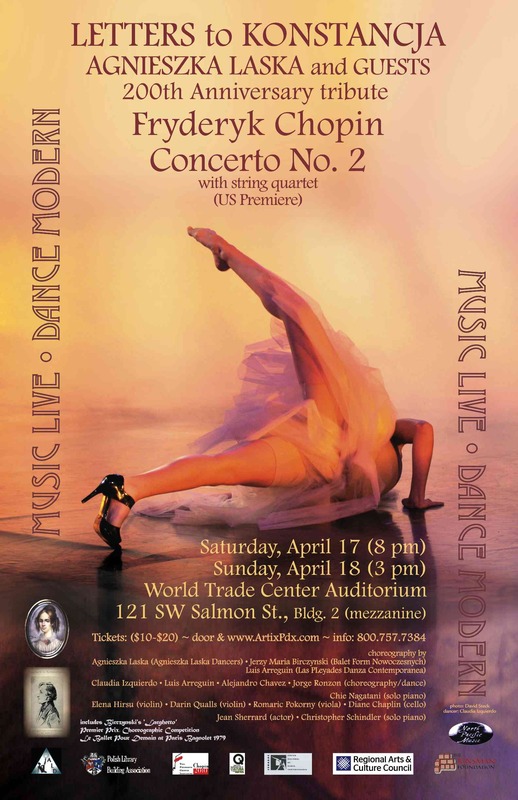 Agnieszka Laska Dancers celebrate the 200th anniversary of Frederic Chopin in a performance to Chopin's Piano Concerto No. 2 in F Minor, played by Canadian pianist Chie Nagatani in a new arrangement with string quartet by fellow Krakow artist, Bartlomiej Kominek. Konstancja Gladkowska was the first love of the composer. The Mourning Mass for the President of Poland, Mr. Lech Kaczynski, First Lady Maria Kaczynska and members of the Polish elite who perished in the tragic plane crash in Russia on April 10, 2010 on the way to a Katyn commemoration will be held at the Polish Church in Seattle. The Book of Condolences will be available for signing. The Book of Condolences is also available for signing at the Polish Home in Seattle for the next two weeks. For more local news related to the tragedy check here. UW Polish Studies Endowment Committee invites to a lecture Return to Democracy or Constant Crisis? Polish Cinema after 1989 by Dr. Elzbieta Durys. Dr. Durys is a UW Fulbright Fellow visiting from Univ. of Lodz, Poland. She will discuss a recent eruption of good quality Polish movies after a long slump since 1989. The Katyn Monument Committee in Seattle invites to a commemoration of the 70th anniversary of the Katyn massacre during WWII. Over 20,000 Polish POW officers were murdered by the Soviet NKVD (KGB) in 1940 at Katyn, Starobielsk, Ostaszkov and other places. Local Katyn victim families, Polish Consul Malgorzata Cup as well as a delegation from Vancouver, BC will attend the commemoration at the Polish Church in Seattle. Organized by A. & B. Bazant, B. Palubicka, A. Mroz and the Parish. 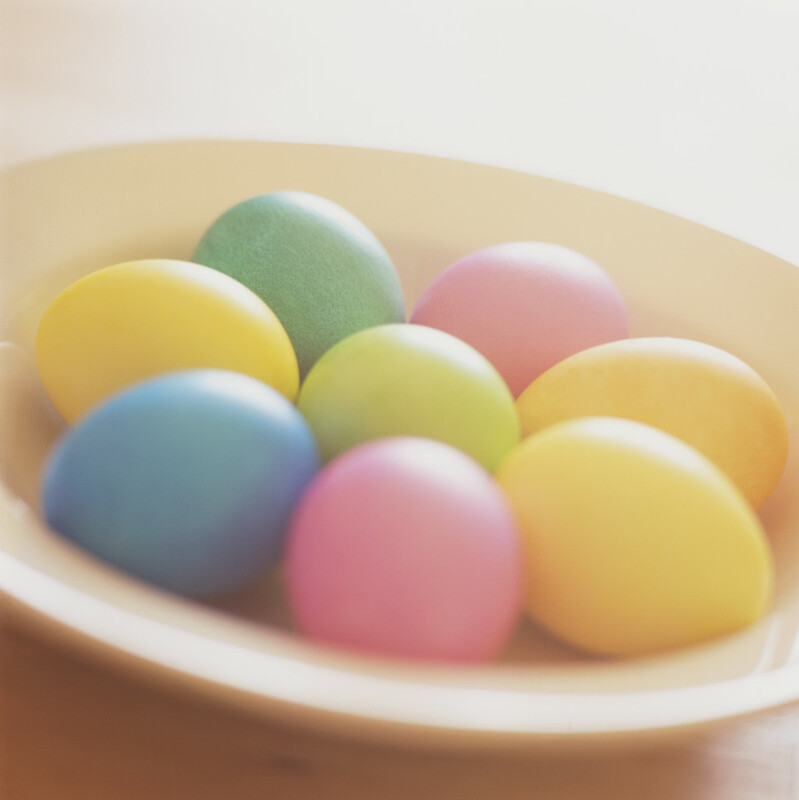 The Easter Egg sharing event has been cancelled due to the Katyn commemoration. Cornish College of the Arts invites to Cannons Hidden Amid Flowers, a piano concert by Ivona Kaminska with music of Frederic Chopin and his predecessors. Dr. Kaminska is a member of the Cornish faculty and co-Founder of the Chopin Academy of Music in Issaquah. The program includes polonaises, mazurkas and nocturnes by Chopin as well as by Maria Szymanowska, Karol Kurpinski and John Field. Trumpet virtuoso Tomasz Stanko, a world class jazzman, returns to the Earshot Festival this year. He is now the leader of Tomasz Stanko Quintet and has a new CD coming up, called Dark Eyes that local fans call the best so far. His music is lyrical and moody and apparently more accessible now. 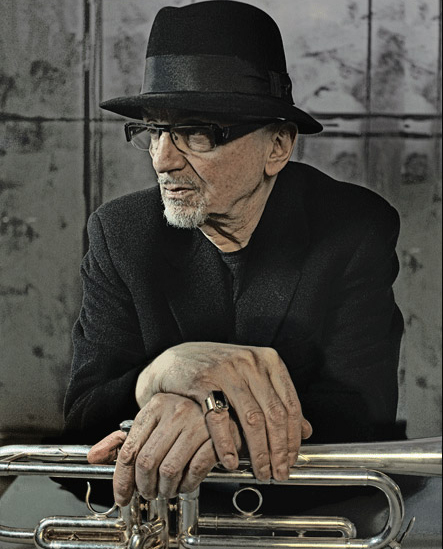 Stanko credits Miles Davis, Chet Baker and Krzysztof Komeda as a source of his inspiration. Elliott Bay Book Company and the Seattle Central Library invite to a promotion and book signing of David Laskin's The Long Way Home. Mr. Laskin is a local journalist and author. The book tells the stories of 12 immigrants who fought for their new country during WWI w/ American Army. Two Polish-American soldiers are featured among the 12 main characters of the book. This is the schedule for blessing of the traditional Easter food baskets on Holy Saturday, April 3, 2010. As is the tradition, the Polish Home is closed on Good Friday, April 2, 2010. The restaurant is also closed on Easter Sunday, April 4.